Venezuela's University Professors Vote With Their Feet : Parallels The collapse of the economy, combined with sky-high inflation, has left university professors earning about $35 a month. Droves of professionals have left, seeking opportunities abroad. 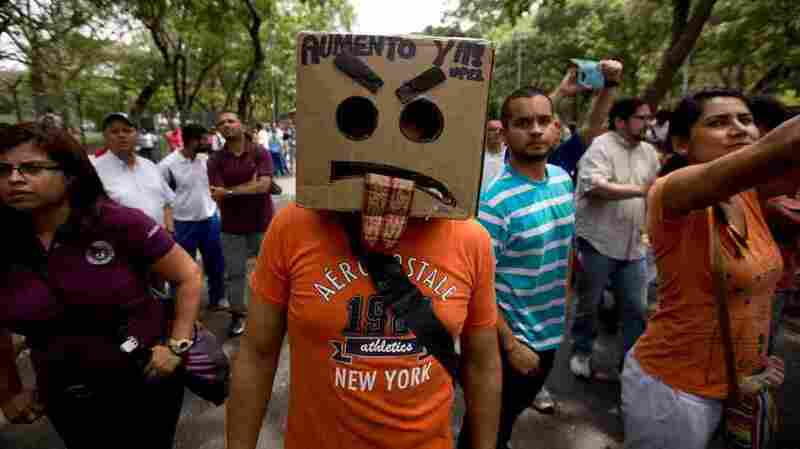 A demonstrator wears a box that reads in Spanish, "Salary raise now," during a protest by university professors and students at Venezuela's Central University in Caracas on May 28. A typical professor's salary is now worth the equivalent of $35 a month due to runaway inflation. Leading public universities have been closed due to strikes since September. Millions of Venezuelans voiced their displeasure with President Nicolas Maduro's Socialist Party by giving opposition parties an overwhelming victory in congressional elections Sunday. But over the past few years, a flood of disgruntled Venezuelans have been voting with their feet, and college professors are among them. Amid soaring inflation, food shortages and a collapsing currency, some of the country's best and brightest are emigrating. The economic crisis has been especially hard on Venezuela's universities, which have lost throngs of professors to better-paying jobs overseas. Tomás Guardia has a doctorate in mathematics, the subject he teaches at Venezuela's Central University, better known as the UCV. It's the nation's most prestigious university, yet Guardia earns the equivalent of just $35 a month. "I only buy food, we don't leave the country, there's no recreation," Guardia said. His 8-year-old son used to go to swimming classes on Saturday, but the family can no longer afford it. That's why Guardia and thousands of other professors at Venezuela's main public universities walked off the job in September. Classes have been canceled for tens of thousands of students. "We deserve salaries that allow us to live with dignity," he said. "That's why many professors are leaving the country." Over the past five years, his university has lost 800 of its 3,000 professors. Some have taken teaching positions in the United States, Europe, Brazil and Colombia. "We still have good universities in Venezuela but we are very quickly losing quality because of the brain drain," said Benjamin Scharifker, who serves on Venezuela's National Council of Universities, a policymaking body for the country's universities. Scharifker blames Venezuela's government. Despite the world's highest inflation rate, the government has refused to increase public university budgets. Scharifker calls this a campaign to weaken universities, whose professors and students have been sharply critical of the socialist revolution ushered in by the late Hugo Chávez in 1999. "Is not that what totalitarian governments want? They want to have a dumb population so they cannot think by themselves. Somebody else would think for them," he said. As the strike continues, the Simon Bolivar University on the outskirts of Caracas sits eerily silent. Some 400 of its 1,200 professors have quit. The university's president, Enrique Planchart, calls the situation "a national tragedy." The Simon Bolivar is Venezuela's top research university, but it lacks the money to replace broken microscopes and machinery. The library is stocked with out-of-date periodicals. The Higher Education Ministry did not respond to NPR's requests for comment, but government officials have argued that, amid the economic crisis, universities must tighten their belts. Back at Venezuela's Central University, people use the empty campus grounds to picnic and take salsa classes. Guardia, the math professor, sometimes contemplates leaving. "I was born (at the university hospital), I studied here, I fell in love here, I made my academic life here," he said. "That's why I'm still here."